In our K4 class, we are always talking about being kind and how we can be kind to others. We recently had a special guest (a princess!) visit our class and talk about bullying and being kind to others. 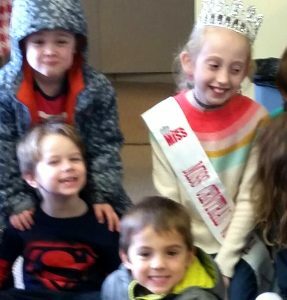 Leigha Harris, the reigning USA National Miss Central Virginia Princess – and a former ECSP student – came to our school to talk to us about her platform of bullying and being kind. Leigha read to the students a story about how one of the Berenstain Bears had been bullied and how they felt and dealt with the situation. 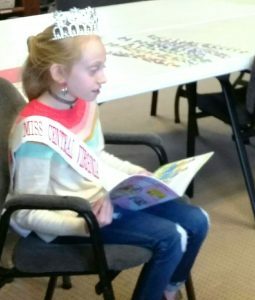 Leigha gave the students stickers, coloring sheets, and let them look at her beautiful, sparkly crown. Leigha didn’t get to wear her princess gown to school as it was a very messy, rainy day when she visited. The students were so happy that they got to see and meet a real princess at their school. Thank you Leigha for your special visit to ECSP! Second and Third Graders love "Scoot"!